Kale; that hardy salad green that is oh so trendy, we know it’s loaded with antioxidants and really healthy, but if not done right the bouncy, hardy greens can be rather unappetizing! The trick I have found, is to dress up the kale with a tangy dressing, and really give it a good massage to evenly distribute the dressing. My favorite type of kale to use is a combination of the Curly and Lancino Kale, these hardy leaves hold up well when dressed and taste quite delicious once they are marinated, perfect for your holiday take along dishes! 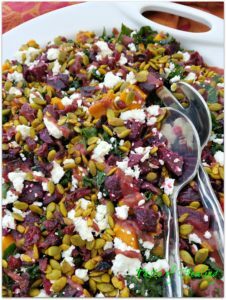 The kale provides a delicious base for a variety of toppings; my favorite winter addition is a medley of beautiful, jewel like roasted root vegetables, finished with lightly toasted seeds and cranberries, and perhaps a little crumbled feta, perfection! I hope you enjoy this crowd pleaser recipe, it is gorgeous languishing on a large platter, or plated individually with some chicken or salmon added. In a small sauce pan, place fresh cranberries, water and sugar over medium heat. Let it come to a boil and once the first cranberry pops, simmer for about 5 minutes until all the cranberries pop open, set aside to cool. Place the cranberries in a blender, add the vinegars, mustard, lemon juice, oil, seasoning and salt and blend until smooth. Add Stevia to taste and adjust seasoning if necessary. To roast the vegetables: cut into even size cubes about 1”. Place in separate roasting pans, coat with a small amount of coconut oil, season with salt and roast at high heat, 450F for 30 to 40 minutes, stirring every 10 minutes or so. Trim kale by removing stems/stalks and shredding into strips. Toss in a bowl with the dressing, working it through with your hands. 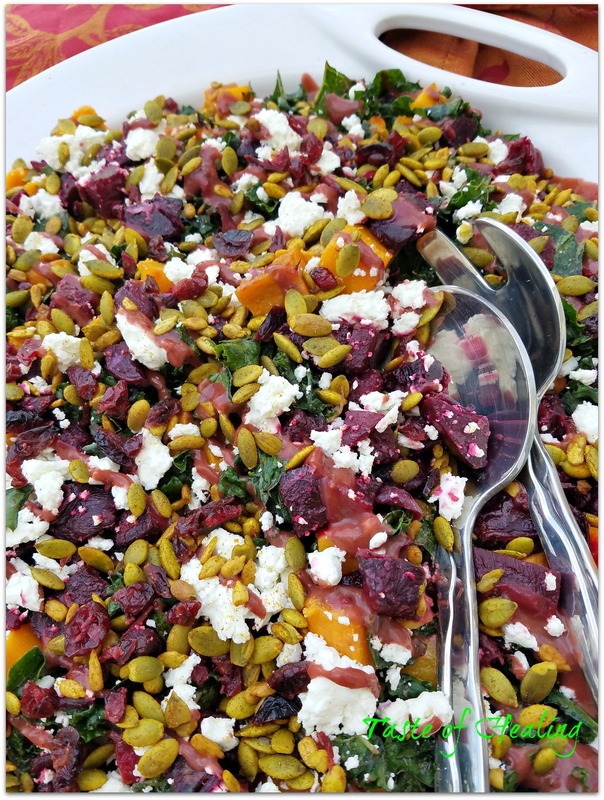 Layer on a platter with the kale topped with the roasted vegetables and finishing with the feta, dried cranberries and seeds. Reserve remaining dressing until ready to serve.